German tuners try their hand on the Maserati Quattroporte. CDC Performance has released their latest aftermarket program for the Maserati Quattroporte. The German tuning company has given the Italian sports some new style and increased performance for a totally new feel on the four-door Mas. Starting under the hood, CDC has added a twin-compressor system with intercoolers, new exhaust system and a revised ECU for increased output from the Maserati&apos;s V8. Total output has jumped up to 580hp and 420 lb-ft of torque, up from the stock&apos;s 400hp and 339 lb-ft of torque. CDC Performance has also added their own 22-inch concave alloy wheels to the Maserati and, along with a stainless-steel coilover suspension, the Quattroporte rides better than ever. Bigger brakes have been added to handle the improved power. 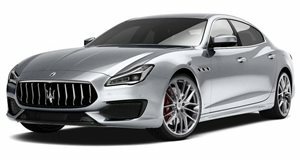 All that power increases performance dramatically, as the Quattroporte now races to 62mph from rest in just 4.6 seconds and can reach a top speed of just under 186mph. The stock Quattroporte reaches 62mph from rest in 5.3 seconds and attains a top speed of only 174mph. In terms of styling, the Maserati Quattroporte has received a very aerodynamic body kit. The kit comprises of a front spoiler on the bumper, side skirts, rear apron with integrated diffuser and roof and rear spoilers. All parts were hand-built with what CDC calls a "12K carbon weave." The front bumper also features integrated LEDs along with the taillights. A new front grille was finished in black aluminum mesh. The interior features plenty of carbon and leather. Black leather wraps the seats while red Rosso Piazza stitching creates a very bold contrast. The center console, door sills, dashboard and side panels all feature plenty of carbon fiber. The Maserati Quattroporte by CDC Performance is listed for sale now, though no pricing information has been made available to the public. Check out the incredible creation in the gallery below.